Operation Christmas Child : Kathie Hill Music, LLC, Making music with and for kids for over 25 years! Spend your Christmas at Fort Faithful with peace-keeping troops led by Sergeant Smarter with Private Eye, Private Elvis Presby, and Private Gomer Smyle as Unit 12-25 embarks on a mission called Operation Christmas Child. But just who is this "Christmas Child" and what's inside the many gifts they must deliver? Written to promote the "shoe box ministry" of the Christian relief organization, Samaritan's Purse, Operation Christmas Child is an inter-active musical experience to involve your boys and girls in this worldwide child outreach. Veteran children's writer, Kathie Hill, has created a humorous, yet touching scenario to emphasize the gift of Jesus' birth and the motive for sharing our blessings with others. Incorporated into the story line and included in the Director's Aide and Video is a message from Samaritan's Purse president, Franklin Graham, along with footage of children across the globe receiving their Christmas shoe boxes. These images, combined with songs like "Christmas Started With a Present," "First John 3:16" and "Simple Things" will highlight the needs of others while the characters in Operation Christmas Child will touch your congregation's funny bone and challenge everyone to participate in this vital ministry. 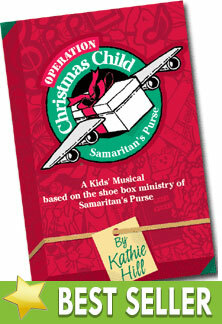 Kathie's Note: This musical is the perfect way to start or augment an Operation Christmas Child shoebox collection. The script is filled with humor and boys love the military setting. The work has high production value and great songs like “Lots and Lots of Boxes’ and “Simple Things.” ‘Come and Worship Jesus.” will bring you to tears! The Story of the Christmas Child includes What Child is This? Jewel cased CD with spilt left channel instrumentation/right channel choral vocals and stereo instrumentation only. (No dialogue or solos.). Downloadable pdf of all songs, script, production notes & piano transcription for Operation Christmas Child musical & information for packing OCC boxes with permission to make 3 copies . Additional copies require purchase of additional 3x license/s. File is 116 pages. Up to 200 downloadable pgs of lesson plans, kick-off ideas, musical & spiritual activities and production & organizational helps. Downloadable orchestrations for 6 songs for brass & sax.